Eau Pleine Township, by all accounts, has the most colorful history of any township in Portage County. 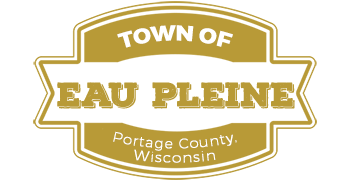 The most descriptive story of our township comes from historian Malcolm Rosholt in his classic book, “Our County Our Story – Portage County, Wisconsin” published by the county’s Board of Supervisors in 1959 and printed at Worzalla Publishing of Stevens Point. Originally formed in 1851, the township of Eau Pleine changed boundaries several times until 1899 when the present boundaries were finally established. In 1895, a plat of Eau Pleine shows the town hall located on River Road in Section 10. Early census records show that in 1880 the population was 598, in 1890 – 748, in 1900 - 1,086 and in 1910 - 1,094. By 1920, the population peaked at 1,126, but by the year 2000 dropped to 931 residents. Today, 960 residents call Eau Pleine home. Without doubt, the most memorable early resident of our township was French Canadian John Baptiste Dubay, considered the first white settler in Portage County. In 1830 he opened a trading post on the Wisconsin River downstream from the mouth of the Little Eau Pleine River. Later in 1851, Dubay established the first post office in northern Wisconsin near his “Eau Pleine” trading post. In 1857, Dubay was tried for the murder of William S. Reynolds at Portage but was freed by a hung jury. He died at age 77 in 1887 and is buried under a granite monument on the northeast banks of the lake bearing his name – and just over the border in the Town of Knowlton, Marathon County. His tombstone reads, “Jean Baptiste Dubay, 1810 -1877, Son of a Menominee Indian Princess, Son-N-Law of Chief Oshkosh, Treaty Maker, Interpreter, Indian Trader, Firm Friend of White Men.” The historic trading post site was submerged and “lost” when the dam creating Lake Dubay was built in 1942 to generate power for area paper mills. A historical monument commemorating Dubay’s Trading Post can be found along County Highway E in the Portage County Dubay Park. In 1876, a post office was opened in the sawmill town of Runkel Mills east of the present day corner of county roads H, O, and G – “hog corner”. Today, the only remnant that remains is Runkel Cemetery. The post office, a store, boarding house blacksmith shop and several residences reportedly burned down in 1886. Historic River Road, on the eastern boundary of our township, carried early trappers, traders and settlers north from Stevens Point to the northwoods. It followed the early Native American footpath along the western side of mighty Wisconsin River - the hardest working river in our state and marks the eastern edge of the township. Over time, the storied river has drawn generations of hunters, trappers and anglers to its banks. The spring walleye runs are legendary as hundreds of fishermen gather below the dam at Lake Dubay annually when the ice goes out and warm water draws fish upstream. Wisconsin is known as the “Badger State” - from the nickname “badgers” given early lead miners who found shelter in holes they dug. In 1898, a company called Wisconsin Graphite was established and an active mine northwest of Junction City in the township of Eau Pleine was created. According to Rosholt, “The mine shaft was around 70 feet deep, while laterals, high enough for men to work with picks and shovels, had been extended east and west some 35 to 40 feet.” The mine operation ultimately pulverized and processed graphite for paste and paint until 1909, when two catastrophes – a cyclone and fire – caused operations to cease. In 1938, the Wisconsin River Hydro Authority was organized and proposed reservoirs and dam systems on the Wisconsin River in Eau Pleine, as well as two others upstream on the Little and Big Eau Pleine Rivers. George Mead, of the Consolidated Paper Company family, once told me that he remembers as a young lad standing with his father on the earthen dike near the new dam being constructed on the Wisconsin River, and looking over the landscape that would forever be transformed into the 6,700 acre Lake Dubay. He remembers the exact day, December 7, 1941 – because while driving home he recalled listening about the bombing of Pearl Harbor on the car radio. The second dam was proposed to be built just south of Dancy along Highway 34 in our township. It would have created yet another flowage across the Little Eau Pleine River valley that would be much larger than the flowage on the nearby Big Eau Pleine River. In the end, local opposition and economics ended the attempt – but fortunately, the Mead family donated the land which became the publicly owned Mead Wildlife Area.